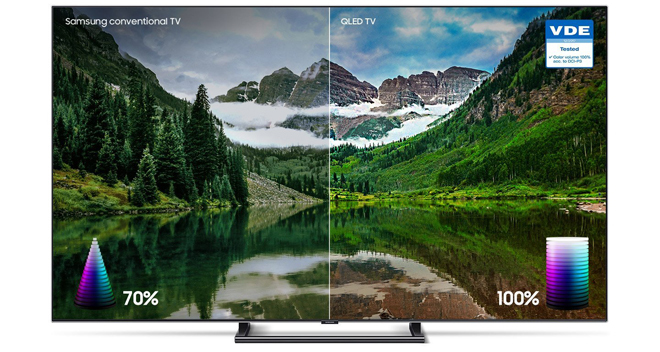 Overview -- Powered by quantum dot technology, the Samsung 2018 Q9F QLED 4K Ultra HD TV boasts Full Array Local Dimming, support for standard HDR10 and the new dynamic HDR10+ format, P3 wide color gamut coverage, and robust smart TV capabilities with Bixby Voice control. The results? A genuine flagship LCD display with incredible black levels and some of the industry's leading color and brightness performance. With that said, blacks still can't quite reach the pixel-level precision of OLED tech, Dolby Vision support is sadly missing, and the price is definitely on the steep side. Likewise, my initial review unit had a seemingly isolated defect that caused signal issues with 4K devices, though Samsung sent a replacement TV that worked just fine. But all minor caveats aside, when it comes to picture quality, this is one of, if not the, most impressive LCD display I've ever seen, arguably offering even better overall 4K HDR performance than an OLED set. Basically, if you have the cash and want the absolute best that LCD tech has to offer, then the Q9 is Highly Recommended. When shopping for a new TV, users typically have a few different price and performance tiers to select from. An entry level set will get you basic specs for a budget-friendly price, a mid-range model will step things up with a few extra features for some added cost, and a true flagship unit will provide the absolute best a manufacturer has to offer for an appropriately premium fee. Samsung's new 2018 Q9 QLED 4K HDR Ultra HD TV definitely falls into that latter category, cementing itself as one of the year's absolute top display offerings. 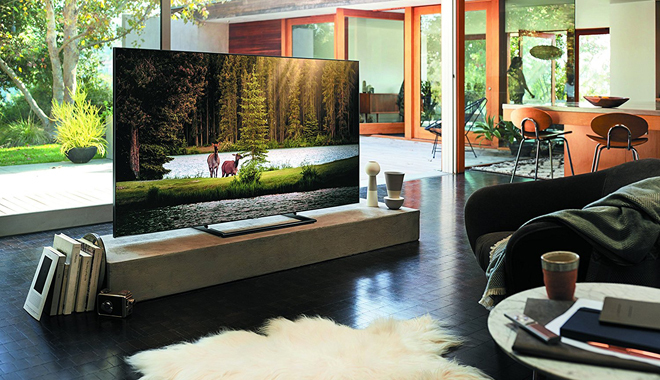 Blending all of the latest and greatest LCD picture quality advancements with all of the latest and greatest smart TV bells and whistles, the high-end display pulls no punches when it comes to HDR performance and lifestyle perks. 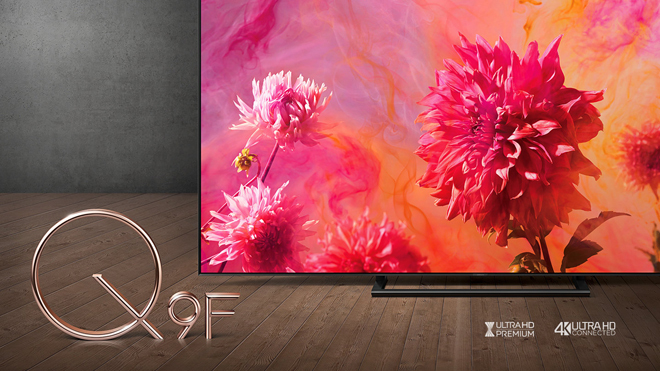 And though leading OLED sets might have an edge in certain departments, the Q9 proves that LCD panel technology still has a lot to offer in the 4K generation, outputting nits so high you might end up reaching for your sunglasses. 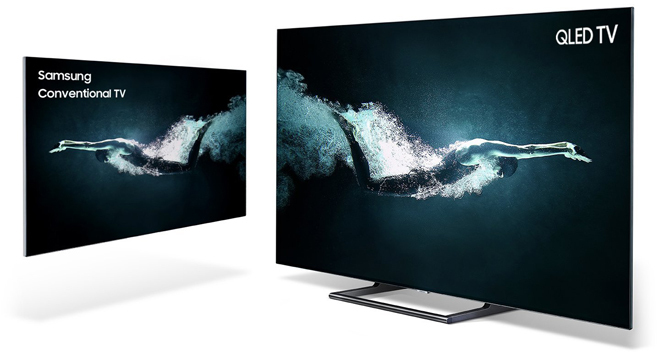 The 2018 Q9FN QLED 4K HDR Ultra HD TV is currently available in 65-inch and 75-inch screen sizes in the US. The 65-inch model received for this review uses a VA LCD LED panel with a 16:9 aspect ratio, an Ultra HD resolution of 3840x2160, a 120Hz native refresh rate, and Ultra HD Premium Certification. In addition, the panel features full array local dimming and uses quantum dot technology to support the wide DCI-P3 color gamut with 100% color volume. HDR10 and HLG high dynamic range playback capabilities are included as well, along with support for the new dynamic HDR10+ format. From a design perspective, this is a rather handsome display, offering an appropriately premium look with a midnight black color scheme, a nearly bezel-free construction, a nice textured look on the back panel, and a very thin screen profile of about 1.5-inches. A black metal stand is included as well with a cool industrial look, but while I mostly prefer this style to the increasingly common left and right leg design, the unique form factor here might make it a little tricky for users who want to position a sound bar in front of the TV. With the stand attached, the TV measures 57.1"W x 34.1"H x 14.4"D, and weighs 62.8 lb. The panel itself only features a single connection port on the back for the TV's proprietary slim One Connect cable. Wall mounting options are also supported as well, including Samsung's No Gap Wall Mount. Meanwhile, all of the Q9's remaining inputs and outputs are housed on a separate One Connect Box. The unit measures about 15.4" x 5.2" x 2.6" and includes four HDMI ports (one with ARC), three UBS ports, an Ethernet jack, OTA support via an RF In for digital antennas, a digital optical audio out, and a power connection. Under the hood, the display is powered by a quad-core processor and uses Samsung's Smart Hub platform fueled by the Tizen OS. Wi-Fi and Bluetooth wireless connectivity are included as well. In addition, the package also comes with a stylish silver metal OneRemote with Bixby voice control and a simplified yet functional button layout. And though most buyers who are going to shell out over $3,000 for a TV will likely have a separate surround system ready to go, the display does include integrated 60W 4.2 channel speakers. They sound pretty decent for TV audio and get the job done for casual listening, but definitely carry a tinny quality compared to a full-fledged audio system. After unpacking the box, initial setup is fairly straightforward but a bit more involved than some other more plug-and-play friendly sets. Users just need to screw the included stand onto the panel, plug the OneConnect cable to the TV's port and separate OneConnect box, plug in the power cable from the OneConnect box, and then connect any other HDMI devices. 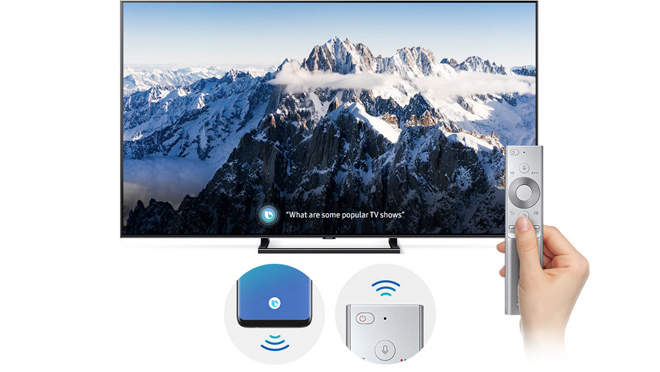 Thankfully, should a connection hiccup like this occur, users can simply complete the setup process using the TV's OneRemote. After selecting the language, entering in my Wi-Fi info, accepting more Terms & Services, and adding apps to the SmartHub menu, the initial setup was at last complete. For review purposes, I primarily used an Onkyo TX-NR555 AV receiver connected to the display's HDMI ARC (audio return channel) input, allowing the receiver to pass-through full bandwidth 4K Ultra HD HDR content to the screen and the display to transmit audio from its apps to the receiver. In addition, I also swapped in a Pioneer VSX-933 receiver for part of my testing as well. With ARC and CEC (consumer electronics control) enabled in the menu, the display automatically recognized that a receiver was connected and used that corresponding label for the HDMI input. Thanks to CEC, I could also use the OneRemote to adjust the receiver volume. Likewise, the display was capable of successfully sending Dolby Atmos audio from VUDU to the Onkyo receiver when DD+ was selected in the TV's audio menu. With that said, the Pioneer receiver had some issues in this regard. Initially, no audio would play at all when an Atmos film streamed through VUDU, but after cycling through the audio modes on the receiver the Atmos track would eventually get flagged and kick in. This was the case time and time again when playing streaming Atmos movies connected to the Pioneer model. I'm not sure why this cycling through modes was necessary and it remains unclear whether the problem was being caused by the receiver or the TV. Meanwhile, when it comes to picture calibration, the Q9 includes a comprehensive selection of adjustments and modes. In general, the default Movie Mode with all unnecessary enhancement options deactivated will provide the most accurate out-of-box picture suitable for most users. Of course, if one desires to perform a full white balance and greyscale calibration, the TV offers more than enough control to fine tune things even more. Unlike Samsung's 2017 flagship model, the new 2018 Q9 features the very welcomed return of Full Array Local Dimming. This technology uses LED light sources positioned in multiple dimmable zones across the TV's panel, allowing the screen to brighten or totally darken in selected spots to coincide with the content being played. As a result, the display is able to achieve deeper black levels and more precise HDR highlights compared to edge-lit models or LCDs without any dimming. The effectiveness of local dimming is based largely upon how many zones a manufacturer is able to implement in the panel (in general, the more the better) and the particular algorithm a company uses to tell those zones how to operate. Thankfully, Samsung has pulled out all the stops on both fronts here. Though an exact number is not specified, the Q9 reportedly includes around 480 dimming zones. For comparison's sake, leading models from companies like VIZIO and TCL cap off at around 190 zones. And though not perfect, the algorithm does a great job of maximizing the potential of each and every zone. In general, the local dimming allows the TV to display true black. And I mean genuine, disappear into a dark room black. In fact, the Q9 offers the most impressive black level performance I've ever seen on an LCD, frequently reaching OLED-level inkiness. Likewise, common artifacts and quirks associated with the tech, like blooming around brighter objects, were often negligible or completely absent during my testing. All that said, the dimming isn't entirely flawless. For one, detail can get a tad lost in dark scenes. Some stars in outer space shots might not be as visible as they are on some other displays, for instance, but in general, the panel strikes a solid balance between minimizing blooming and maintaining shadow delineation. Beyond minor crush, there are also times when some more discerning users will be able to spot the zones and algorithm at work. The most common side effect I noticed involved delayed dimming in certain spots of the screen when cutting from a very bright image to a very dark one. For instance, when transitioning from one shot in Game of Thrones with a bright candle in the background to another shot with a dark and mostly black background, the brightness from the candle would remain on the screen for about a second as the zone quickly dimmed from an elevated gray to complete darkness. Though not terribly distracting, instances like this were noticeable here and there -- particularly when watching HDR content with a mix of many bright and dark images. A similar quirk also cropped up when displaying shots with bright backgrounds in certain content. During isolated instances, details in these backgrounds (like objects outside a window or clouds in a sunlit sky) would first appear too bright and blown out for a split-second before dimming down just a tad to let the details quickly fill in. Switching the Local Dimming setting from High to Standard or Low (it can't be turned off completely) would lessen these effects but at the cost of a heavy reduction in max nit output when placed in Movie mode. With that in mind, I definitely preferred to keep Local Dimming set to High in order to ensure the best HDR performance. Finally, as impressive as the dimming is, 480 LED zones still can't quite equal the pixel-level precision of OLED contrast. The Q9 comes closer than any LCD I've tested before, but emissive OLED tech still has a clear edge in this department. That said, LCDs like the Q9 offer their own specific advantages that OLEDs can't compete with yet, especially when it comes to max HDR brightness. To demo the Q9's overall HDR picture performance I watched a variety of 4K Ultra HD Blu-ray discs, HDR10 streaming content from services like Netflix and VUDU, and HDR10+ streaming content from Amazon Prime Video, including titles like Game of Thrones, A Quiet Place, Red Sparrow, Love, Simon, Logan, Blade Runner, Ex Machina, La La Land, The Punisher, Arrested Development, Justice League, Spider-Man: Homecoming, The Tick, Mozart in the Jungle, and Manchester by the Sea. To put it simply, the Q9 is easily one of the best showcases for HDR video that I've seen. The picture isn't without some minor flaws, but the detail, color volume, black levels, and nit output here all make for a truly jaw-dropping image. Specular highlights were simply dazzling in all of the content I watched, getting so bright the screen genuinely made me squint from time to time. To be clear, I'm not saying the Q9 just outputs blinding brightness all the time for no reason -- I just mean that when a scene calls for it, the TV is more than capable of reaching the 1,000 nit peak that most HDR material is graded for. In fact, the set is actually capable of exceeding 2,000 nits in bursts when placed in the Dynamic picture mode and offers a more consistent max of around 1,500 nits in Movie mode. Likewise, thanks to the local dimming, smaller highlights can be brightened with impressive precision while still keeping other areas of the screen dark. More aggressively graded HDR10+ material like The Tick on Amazon simply popped from the screen with gorgeous primaries and sparkling whites. Neon lights glowed from the panel in Blade Runner while still preserving detail, and the gorgeous saturated palette of La La Land sparkled with appropriate flash without ever bleeding or crossing the line into exaggerated harshness. Instead, the wide gamut coverage and impressive color volume here rendered a vibrant but still natural image at various luminance levels. Likewise, comparatively conservative content like Game of Thrones maintained a pleasingly subtle HDR appearance, providing a more delicate extension of contrast and color, bringing added depth and range to every hue without artificially boosting the image. Though some titles, of course, looked better than others, in general, the level of detail visible in 4K material, coupled with the punchy HDR brightness and the exceedingly inky black levels, resulted in a pleasingly glossy image throughout all of the content I watched. And for even more impressions on HDR10+ content through the Q9, CLICK HERE to check out our detailed First Look piece. As gorgeous as HDR performance on the Q9 is, however, the display could be a little on the forceful side with its tone-mapping in some instances, leading to slightly hot contrast in brighter images. On that note, I detected a slight loss in detail in extreme highlights in some content, especially on faces, though I'm not sure whether that was a result of the TV itself or just the grading on these titles. Thankfully, this wasn't an issue in the majority of the material I watched. Outside of Ultra HD content and high dynamic range imagery, I also sampled several SDR Blu-rays and streaming shows, including titles like Wall-E, Westworld, Dawn of the Planet of the Apes, Game of Thrones, The Big Country, Pacific Rim, Wonder Woman, The Handmaid's Tale, and more. As one might expect, performance was essentially flawless. The spacewalk sequence in Wall-E was especially gorgeous, with sumptuous blacks and sparkling contrast. Some of the quirks I noted above pertaining to local dimming were still visible from time to time, but overall picture quality was simply astounding with a deep inkiness, rich yet natural colors, sharp detail, and nicely balanced contrast offering an accurate SDR Rec. 709 image in the default Movie Mode. Likewise, the set's scaling for high-bitrate 1080p sources was great, revealing no real issues to speak of. With that said, lesser quality HD streams and lower-res content definitely showed their limitations. For whatever reason, HD YouTube streaming (even at 1080p) was particularly underwhelming. Of course, the better a display is at rendering high-quality images, the better it also often is at revealing and accentuating pesky flaws inherent in lower-quality content. When it comes to overall screen uniformity, the Q9 is once again very strong but not quite perfect. When displaying full-screen test patterns with various colors, the screen maintained solid consistency, but certain areas of the panel could look a tad brighter or darker than others, particularly toward the edge of the display. Likewise, I noticed a very faint purple hue toward the edges of the screen as well but these flaws were never visible during actual real-world content. A slight dirty screen effect was apparent during fast motion or panning when the screen had a lot of white on it (like a hockey game) but, in general, this wasn't very troublesome or outside the norm of most LCD screens. Thanks to the sets local dimming, black uniformity was essentially perfect and free from any clouding, making it appear as if the screen was off when displaying an all-black screen. Meanwhile, viewing angles were pretty good for an LCD but still nowhere near as strong as an OLED set. When sitting toward the side of the screen, colors and contrast did take a slight hit resulting in a comparatively washed-out appearance, though less so than many other LCDs. More noticeable, however, was a loss in black level performance, reducing the local dimming's effectiveness and black uniformity the further from center a viewer sits. Finally, the screen actually does a very good job of handling reflections. My living room setup forces me to place the TV directly across from two windows that let in a lot of direct light on the screen. And though I typically have blackout curtains closed for critical viewing, with the curtains pulled back reflections were surprisingly manageable. Of course, the TV's incredible brightness helps a lot in this regard too, offering some of the best daytime viewing performance in a fully lit room that I've ever seen. Powered by the Tizen OS, Samsung's SmartHub platform offers a fairly robust selection of streaming apps, including popular services with 4K HDR support like Netflix, Amazon Prime Video, VUDU, FandangoNow, and YouTube, along with many other platforms like Hulu, Google Play, HBO GO, Showtime, and more. Navigation and playback were generally seamless and very responsive during my testing with only a few isolated glitches here and there. For instance, the CNN app crashed a couple of times or had out of sync audio, but overall things ran smoothly. The display's Bixby voice control was also pretty solid, allowing me to speak commands to open menus, launch apps, and control playback in select services. With that said, responsiveness varied from app to app, and I ran into some initial issues with YouTube causing the app to crash or lag quite badly when trying to speak search requests. I also demoed the Q9's Ambient Mode which allows the screen to enter a low power, low brightness state in order to display basic information like the time, date, and news headlines when not in use as a TV. 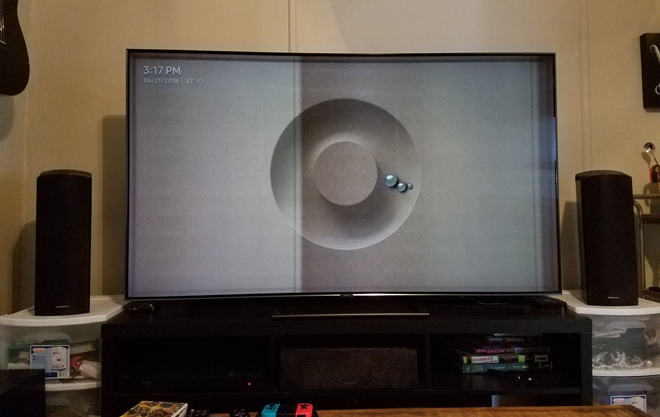 Likewise, users can select from a few different ambient styles or use the SmartThings app to take a picture of the TV and the surface behind it in order to reproduce the appearance of a customer's wall directly on the actual screen, allowing the display to seamlessly blend into a user's room. Though this option is supposed to work best when the panel is wall mounted, I was actually quite surprised how well the image ended up matching my wall right down to the crown molding, especially considering how little of the wall is actually visible between the TV and my speakers for the app to use as a reference. 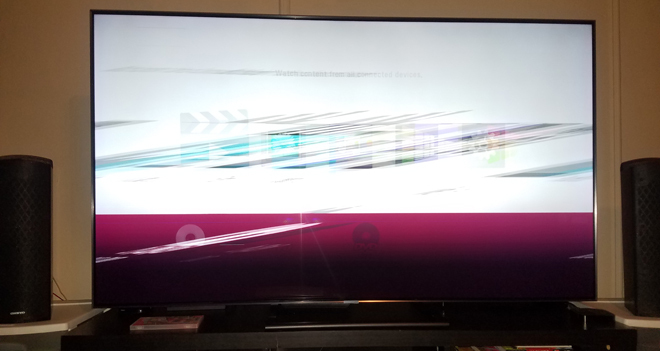 With that said, the app crashed several times when I tried to capture and process the photo of the TV, forcing me to try several times before it finally worked. But even with the image successfully loaded, I didn't really find much use for this mode. To be honest, I see no problem with a TV just looking like, well, a TV when it's off. Likewise, simply glancing at my smartphone remains a far more convenient way to check the time and latest headlines. Still, I can see more design-conscious users taking advantage of this feature when wall mounting the display in a meticulously decorated room. Finally, the SmartThings app also allows users to control the TV, select services, and browse content from a mobile device. In addition, users can even mirror content being played on the TV to a smartphone or tablet. In practice, this all worked just fine and, outside of some lag here and there, I didn't run into any major issues. 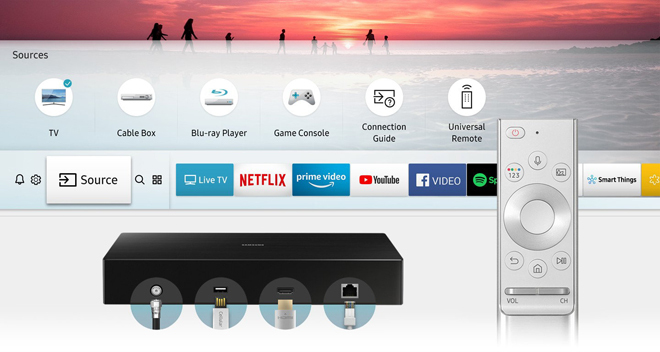 All in all, Samsung has put together a convenient and feature-packed Smart TV platform, even if the system isn't completely immune to a few glitches here and there. Though my time with the Q9 was ultimately free from any major hiccups, my initial review unit was subject to what appears to be an isolated defect when connected to external 4K devices through HDMI -- specifically an LG UP970 4K Ultra HD Blu-ray player, a Sony PS4 Pro, and a Pioneer VSX-933 AV Receiver. To be clear, however, the below issue was not present on the replacement TV Samsung sent, and it seems to have been likely caused by a faulty One Connect Box or One Connect Cable. In order to watch 4K HDR content through HDMI, a setting called UHD Color must be activated in the TV's menu for the corresponding HDMI port. Unfortunately, when this setting was activated, the TV would flash repeatedly and display screen tearing artifacts. Thankfully, I didn't run into anything like this on the replacement Q9. Likewise, I haven't seen any other complaints about the issue online, so the defect does not appear to be widespread. Still, if you happen to encounter anything like this with 4K devices on the Q9, you should contact Samsung customer support to correct the problem. 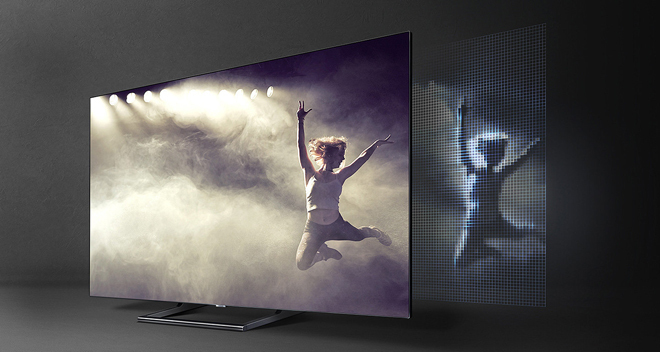 With top-of-the-line color gamut and volume performance thanks to its quantum dot LCD panel and some of the most impressive Full Array Local Dimming I've ever seen, the Samsung Q9 display offers incredible HDR brightness while maintaining exceedingly deep black levels. Some convenient new lifestyle perks, robust Smart TV features, and a premium design aesthetic all round out the package, cementing the TV's flagship status on all fronts. On the downside, as impressive as the black levels are, they can't quite reach the pixel-level precision of an OLED, and while HDR10+ playback is great, I do wish Samsung also supported Dolby Vision. Likewise, at an MSRP of $3,800, the price is a bit high compared to some other competing 65-inch sets in this class. Still, if you have the budget, the 2018 Q9FN is a genuine stunner through and through, proving that LCD tech still has its own key advantages over OLED. For users who want the absolute best HDR brightness performance on the market, the Q9 is Highly Recommended.